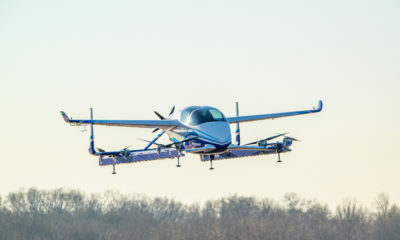 A prototype autonomous passenger air vehicle (PAV), developed by Boeing subsidiary Aurora Flight Sciences under the leadership of the Boeing NeXt division, successfully completed its first test flight in Virginia this week. Although the PAV is designed for passenger transport, the technology presents major opportunities for the future of autonomous and remote pilot cargo operations. The PAV developed by Aurora Flight Sciences is designed for fully autonomous flight using an electric propulsion system and combines the propulsion and wing systems for hover and forward flight. The vehicle has a maximum range of 50 miles (about 80 km) and measures 30 ft. (9 m) by 28 ft (8.5 m). Boeing NeXt is also developing an unmanned electric cargo air vehicle (CAV) designed to transport up to 500 pounds (227 kg), which successfully completed its first indoor flight test last year and will begin outdoor flight testing this year. Boeing has also invested in other companies developing drones for urban deliveries, including US-based Matternet, while larger, long-range drones have also successfully completed flight tests in China, including the Feihong-98 unmanned large cargo drone in development with SF Express. These and other developments in remote piloting, UAVs, and urban delivery technology will be up for discussion at next month’s innovation-focused Cargo Facts EMEA event, during the panel discussion on “Air Cargo’s Next Frontier.” To register or for more information, visit www.cargofactsemea.com.